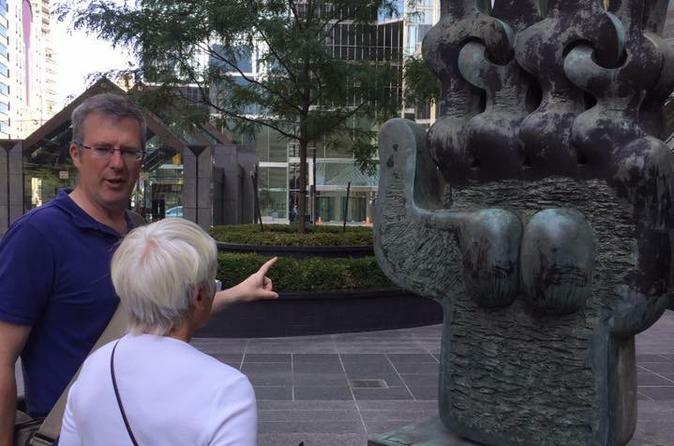 Focusing on art, sculpture, and landmarks in downtown Toronto, TalkWalk is dedicated to the delivery of a welcoming, friendly, thought provoking, intriguing, fascinating, intelligent, factual, fun, and engaging walking experience and discourse. TalkWalk is designed as a conversation or discussion between the assembled. Over 20 different sights and sites on each tour. The good, the great, the bad, the ugly. You decide. Acts of philanthropy; and art as an expected outcome of new development. Gifts to the city; and artwork judged as best meeting the brief by a panel of experts. This morning at 10.00am we depart for our guided walk from in front of Union Station (please meet with your guide, under the railway clock, located outside on Front Street, in front of Union Station) and explore examples of public art, public space, sculptures, architecture, and landmarks in the Toronto downtown core. We’ll discuss what the works say about our city, our people, our history, and our future. The guided walking tour accepts no more than 15 clients to ensure optimum enjoyment for all. The walking distance is roughly 2.5km, mostly on sidewalks, and includes some stairs. Duration is around 2 hours. The tour concludes at Union Station.